Jon Honea weighs down a tarp used to make spotting fish easier in the Shawsheen River in Andover. On a warm, sunny morning, Jon Honea and Burt Batcheller stood on the pedestrian bridge at Marland Place in Andover, peering into the swiftly flowing water of the Shawsheen River below. “There’s two right there!” Batcheller said excitedly, pointing to a pair of 10-inch-long fish swimming over a white sheet of plastic on the river bottom. The 20-foot-by-15-foot plastic sheet, secured in place with large rocks, provided a contrasting background to the tea-colored water and dark river bottom, which allowed the men to better spot migrating fish. What they saw were river herring, a collective term that actually includes two species: alewife and blueback. Honea, an environmental science professor at Emerson College who’s an Andover resident and town conservation commissioner, is heading up a project monitoring the herrings’ return to the river, where they haven’t spawned in nearly 100 years. 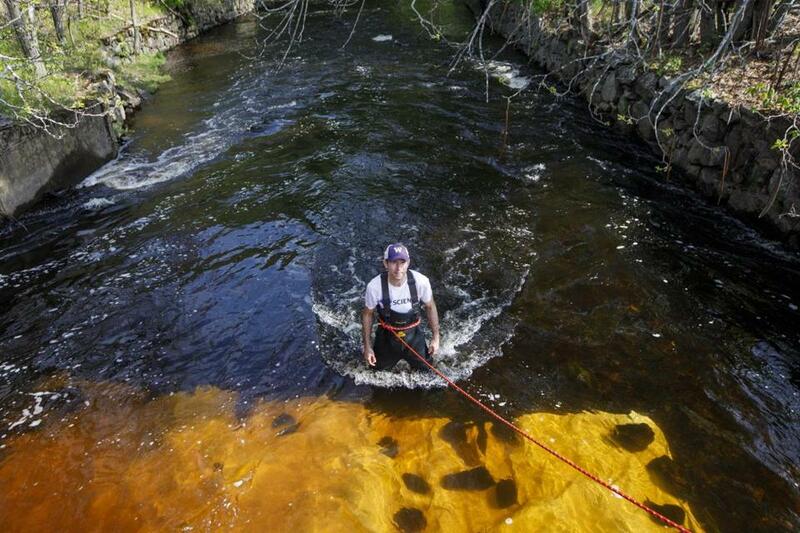 Why haven’t herring been seen in the Shawsheen River in so long? Jane Dietzel-Cairns, former president of the Andover Historical Society, said the presence of two dams across the river made it impossible for the herring to swim upstream to spawn. Both dams were removed this winter. The Marland Place Dam was originally built in the late 1700s, and refurbished in 1823. The Balmoral Dam was built in the early 1920s. The Shawsheen Greenway, which promotes making “the river corridor a vital recreational, cultural, transportation, and educational resource,” said in a statement this is the first time in almost 200 years that the prime breeding habitat upstream from the Marland Place Dam has been accessible to migratory fish. Dietzel-Cairns, who is a board member of the Shawsheen Greenway, said both dams were removed in part because they were aging and rated as dangerous by the state, and because of the risk that they might burst and cause downstream flooding. Honea said other reasons for removing the dams included barriers to migrating fish, such as the herring, and because they were holding back sediment that would normally flow to the ocean and help naturally restore eroding coastal beaches. Honea said removal of the two dams has opened up over 4 miles of additional spawning habitat to migratory fish, including river herring and American eels, allowing fish to spawn all the way up to the remaining Ballardvale Dam, near the Ballardvale commuter rail station in Andover. The Ballardvale Dam — built circa 1835 to power manufacturing of wool flannels — is in much better shape than the dams that were removed, said Honea. Honea said Mass. Fisheries & Wildlife and the National Oceanic and Atmospheric Administration have stated that herring were historically present in the Shawsheen River before the construction of the dams. Honea said he also found a historical reference to a law passed by the state in the 1790s banning obstructions and seining (using large nets) in the Merrimack and Shawsheen rivers for salmon, shad, and alewife herring. The Shawsheen River is a tributary of the Merrimack River, and flows approximately 25 miles from its origin in Bedford to where it empties into the Merrimack in Lawrence. The Merrimack then flows northeast until it empties into the ocean in Newburyport. Honea said herring usually return to the stream they were born in to breed, but since no herring have been born in the Shawsheen in almost 100 years, only strays from the Merrimack River are breeding in the Shawsheen this year. “They’ll be pioneers!” said Dietzel-Cairns. Honea said 46 volunteers signed up to conduct herring monitoring, including high school students from Andover High and Phillips Academy, as well as residents of Andover and surrounding communities. Volunteers often brought family and friends along to help. Batcheller, a volunteer from Methuen and a member of the Shawsheen Greenway, said he has been enjoying the river ever since he was a child. Honea said the group started monitoring the river on April 1, but the first herring weren’t spotted until April 28. A total of 95 herring were counted by fish watchers from April 28 to June 7. Assuming an equal number of fish moved upstream when volunteers were not observing, Honea said he estimated the total number of herring that migrated up the Shawsheen River this spring was about 425. Honea said herring may spawn two to three times in their lifetime, unlike salmon, which often die after spawning. Herring hatchlings stick around about three months, said Honea, before they’re carried by the current to the ocean, where there’s more food. Honea said baby herring eat small crustaceans, then feed on insects as they grow larger. As adults, herring feed on smaller fish. While people also eat herring, there’s a moratorium on harvesting them in Massachusetts because their numbers are so small. Honea thinks the removal of the dams on the Shawsheen River and the return of herring can have a positive impact. Don Lyman can be reached at donlyman@ix.netcom.com.